There are typically two supervisory positions at apartment and condominium properties: the overall property manager (sometimes referred to as the community manager) and the property service manager. Reviewing job descriptions for both of these roles can be helpful if you're responsible for hiring personnel for a complex or property management firm, or if you're considering applying for work in one of these roles. To view either of the job descriptions provided here, simply click on the image. The documents will open as PDF files and you can use the menu bar to print a hard copy or save to your computer. If you need help downloading the printables, check out these helpful tips. You can also edit the text. You can change existing wording by clicking in the row you'd like to change and using your keyboard. 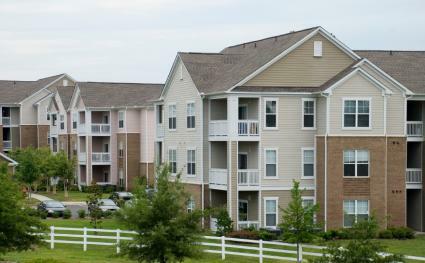 The community manager (or property manager) functions as the general manager for an apartment complex, supervising other personnel at the location. In some companies, this position reports directly to the property's owner while in others the reporting structure goes to a regional vice president based in a corporate office or management firm. 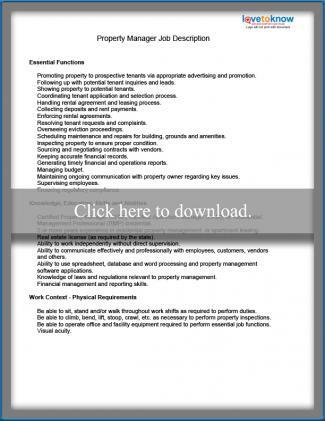 Click to download the property manager description. The property service manager typically reports directly to the community manager and oversees all aspects of operations related to maintenance, repair and facility improvement work. 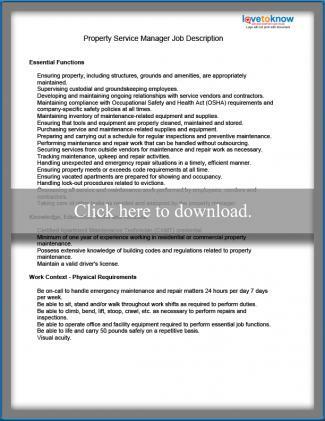 Click to download the property service manager description. It's not likely that the job descriptions will be identical from one property or company to another. The descriptions provided here are for informational purposes and reflect typical duties and qualifications for these types of positions. If you are creating job descriptions for your company, be sure they accurately reflect your organization's expectations for personnel. If you're researching employment opportunities, simply keep in mind that requirements may vary greatly. Be sure that you understand expectations before accepting a job.